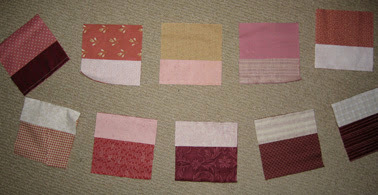 So Ames, the golden rule of patchwork is that all your seams should measure a quarter of an inch. 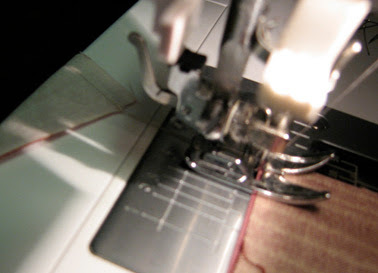 There'll almost always been a line on the plate of the sewing machine that measures this width. The easiest way to get through the squares will be to pick up one of the squares and a short strip. Put right sides together and sew a quarter-inch seam. Don't cut the thread, but pull the thread out a bit and then sew the next square and short strip together. You can continue to do this until you have all the squares sewn to the first short strip in one big long line. Then go to the ironing board, and snip all the threads to separate the squares. When you iron, start with the wrong side and iron the seam to the side of the darkest fabric. Turn the square over and iron flat. Hope between Mum's phone instructions and this, it all makes sense. We need to sort out a day! Haven't actually opened the packet yet.